Filed to: legs legs legs!Filed to: legs legs legs! In the early years of the steam locomotive’s infancy, few believed a smooth steel wheel could grip a smooth iron rail well enough to pull a train. William Brunton beleived he had a solution: Trains with feet. Rails were made of wood or cast iron, neither of which could support a locomotive without shattering. Springs strong enough to support a steam engine did not exist. 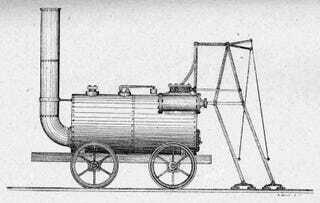 Blenkinsop’s locomotives were the first commercially viable steam locomotives in the world and enjoyed over a decade of use on colliery railways. The locomotive could be light weight because it didn’t rely on adhesion of the smooth wheels to the rails to pull trains, and because it was light it didn’t bust the tracks like Trevithick’s earlier experimental locomotives did. But for some inventors the cog and rack were too obvious apparently. And a number of foot propelled machines were proposed. So far as I’m aware though, only William Brunton actually built one. Brunton’s “mechanical traveller” used pistons at the rear of the boiler to move two giant legs which “walked” the machine along the tracks in a jerky motion. It worked - in so much as one might say it was indeed capable of being both mechanical and traveling. Unfortunately during a demonstration to large crowd of people, the machine exploded while blazing along at a blistering 3mph. Thirteen people were killed in the world’s first railway disaster to claim multiple lives. Brunton never built another one. And that’s why trains don’t have feet. Two legs bad. Lesson learned. However, about ten years later, another man by the name of David Gordon tried fitting propelling feet to a steam carriage. Goldsworthy Gurney, who built several steam powered buses experimented with these feet, as he felt wheels could not supply sufficient traction to move a carriage uphill. However after a great expenditure of money and time, he discovered that the feet worked no better than wheels and also concluded that putting feet on vehicles was stupid. And wheels have won out ever since.